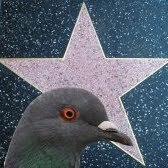 It is very interesting to find a non-pigeon-oriented film (I mean, not a documentary about pigeons) where the main credits are exclusively devoted to a beautiful dove. And of top of that, to illustrate how clever the animal is at solving complex tasks. Indirectly, this scene also introduces us to "pigeon superstitious animal behaviour". In the scene we can see how a dove is trying to catch a piece of food. Unfortunately, the tasty meal is too high and the bird cannot reach it. Oops!!! The pigeon realises that the food is too high. The suspense level dramatically increases when the dove notices the existence of a pedestal than can be used to reach a higher position but it is too far away from the food. However, the dove is able to drag it using its beak, and finally, in a quite surprising way, leverages it to reach the tasty meal. From the bird's perspective, this is a happy end to the story. 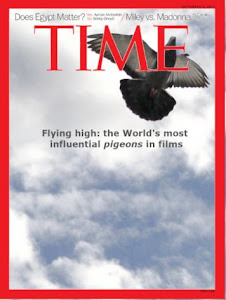 If this scene was not enough birdy propaganda, the film producers use additional time in the film's credits to show more experiments (in black and white) showcasing pigeons solving complex tasks. The complete scene can be seen here. The interesting thing about this theory was it's link with human behaviour. The experiment might be said to demonstrate a sort of superstition. The bird behaves as if there were a causal relation between its behavior and the presentation of food, although such a relation is lacking. There are many analogies in human behavior. Rituals for changing one's fortune at cards are good examples. A few accidental connections between a ritual and favorable consequences suffice to set up and maintain the behavior in spite of many unreinforced instances. The bowler who has released a ball down the alley but continues to behave as if she were controlling it by twisting and turning her arm and shoulder is another case in point. These behaviors have, of course, no real effect upon one's luck or upon a ball half way down an alley, just as in the present case the food would appear as often if the pigeon did nothing—or, more strictly speaking, did something else. Source: Mr Nobody. Starring moment: 0:1:13. Pigeon activity: Pigeons and doves appear solving complex tasks and proving that they can exhibit complex behaviours. Symbolism: High. This scene can be seen as a allegory of the different choices that one person makes in his life and how they change his/her destiny. Relevance: Low. It is surprising to see how such pigeon-intensive credits have no relevance to the film's plot. Training level: Medium. Some of the pigeons were subjected to an artificial environment that causes the behaviours described in this post. 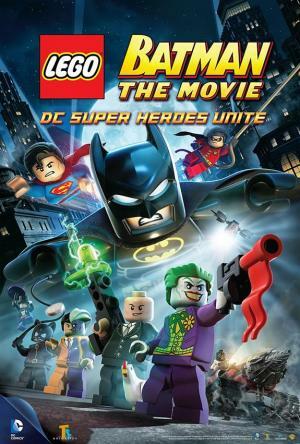 Lego Batman The Movie - DC Superheroes United: lego pigeons!! I was very pleased when I discovered that the iconic megalopolis of Gotham City has pigeons living in it. I think that this is a good example of how we (humans) extrapolate our living environment to imaginary scenarios. One exception that makes me deeply sad is Star Wars, where I couldn't find a single pigeon appearance in the whole saga. It seems that the pigeons had been unable to reach the Star Wars galaxy, that is too far away. I think that we will address this topic in another post. In the screenshot above we can see Mr. Bruce Wayne... sorry! 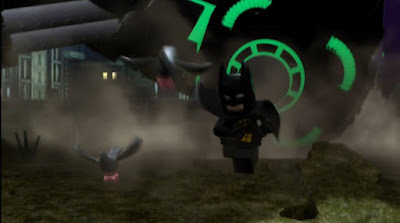 Batman, looking how the evil robot falls down. He is surrounded by pigeons. 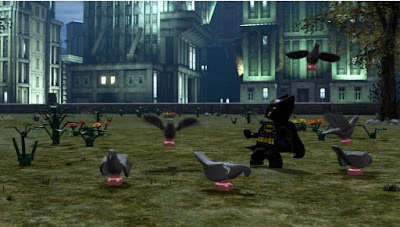 When the robot tragically collapses, both the pigeons and Batman escape scared. It is interesting to highlight that Batman does not pay attention to the pigeons. Of course, he is in the middle of a fierce combat. But, on top of that, it is well known that pigeons and bats are like water and oil.... they can be in the same place, but they don't mix. Pigeon activity: They represent typical pigeon life in urban environments. Symbolism: I think that pigeons are used to provide more realism to the scene. That is, the use of pigeons makes Gotham City to seem like any other large city found in the real world. Relevance: None. Unfortunately, pigeons are unable to help Batman in his tireless fight against the Joker. Training level: Not applicable. They are computer-generated images. Why pigeons? Why pigeons in films? More information about me and this blog can be seen in this link. Matrix: are there pigeons in Matrix?